The St. Louis Post-Dispatch is reporting that the State's Attorney in the southwestern Illinois county of Jersey is weighing whether to file charges against a motorist who hit and killed 52-year old Jennifer Wray Cole of St. Louis while she was riding her bicycle. According to reports, Ms. Cole was an experienced and skilled rider. The Illinois State Police have said it would not pursue charges. However, the State's Attorney Office in Jersey County is the one ultimately responsible for making the decisions as to whether to pursue charges. The incident stems from a collision that occurred when Ms. Cole was riding her bicycle and attempted to make a left turn. According to reports, at the same time a motorist attempted to pass Ms. Cole and a collision occurred. The impact from the collision threw Ms. Cole from her bicycle and as a result she sustained injuries that were fatal. Witness reports apparently reflect that the motorist passed too close to an intersection and also that Ms. Cole did not signal her turn far enough in advance of her turn. However, the report fails to point out two key points about the Illinois Rules of the Road as it applies to bicycles. First, a motorist may only pass a bicyclist when they have three (3) feet of clearance around the bicycle. Second, a bicyclist is required to ride "as nearly as is practicable" to the curb. Meaning that Ms. Cole would have, as do all bicyclists, made a "wide" turn from the far side of the road to the left. 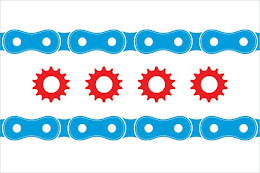 Bicycles are permitted users of the roadway, but due to Illinois' laws and the nature of a bicycle use the roadways differently than a motor vehicle. This collision appears to be another unfortunate reminder that many motorists due not appreciate or acknowledge these laws and the very nature of bicycling on a roadway. If you have any questions regarding this post or an issue involving Illinois personal injury law, please contact Illinois Bicycle Attorney Mike Keating at 312-208-7702 or MKeating@KeatingLegal.com. Keating Law Offices represents individuals and their families throughout Illinois. All initial consultations are confidential and free.